On the eastern bank of Hooghly river near Kolkata, there is a Hindu temple located in Dakshinwswar known as Dakshineswar Kali Temple. The temple was built in 1855 by Rani Rashmoni, a philanthropist and a devotee of Kali. the presiding deity of the temple is Bhavatarini, an aspect of Kali, meaning, 'She who liberates Her devotees from the ocean of existence i.e. Samsara. A fomous mystic of 19th century Bengal named Ramakrishna was associated with this temple. A shrine dedicated to Rani Rashmoni, a bathing ghat on the river, a temple to Radha Krishna and twelve shrines dedicated to Shiva are there. Temple of shiva and vishnu are located here. There are many places to visit in Dakshineswar. "There is no need to go to Banaras. Install my statue in a beautiful temple on the banks of the Ganges river and arrange for my worship there. Then I shall manifest myself in the image and accept worship at that place." After this dream Rani Rashmoni decided to install the God and Goddess on the Snana Yatra Day, an auspicious day of Hindu. About one lakh Brahmins were invited from different countries on this auspicious day. From April to Septemtember: 6 a.m to 12.30 p.m and 3:30 p.m to 9:00 pm. 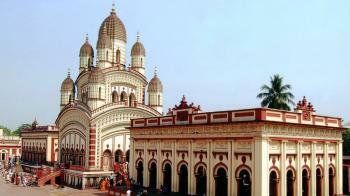 October - March is the best time to visit the Dakshineswar Temple. By Air : Nearest airport is Netaji Subash Chandra Bose Airport. By Rail : Nearest railway station is Howrah Railway Station. By Road : Kolkata State Road Transport Corporation provides bus services to Dakshineswar Temple from all major cities in Dakshineswar.